There's a Card for That: Hello Halloween Series | ft. Lawn Fawn "Trick or Treat"
Hello Halloween Series | ft. Lawn Fawn "Trick or Treat"
Today's card was inspired by Tracey McNeely, over on the Muse Challenge. The ladies over there are so fantastic with their designs and always provide excellent inspiration for the challenges. As you'll see at the bottom, Tracey went with a Christmas themed card, and while I love the CAS style of it, I'm not ready for Christmas just yet. Well, not ready to post the Christmas stuff just yet, anyway. So here is my more Autumn twist on her inspiration card. To begin, I used the smallest and forth smallest of my Spellbinder nested circle dies to cut a doughnut shape in 110lb Copic-friendly cardstock. I then stamped the small candy corn from Lawn Fawn's "Trick or Treat" stamp set, using Memento Tuxedo Black ink, in a circle around it. I felt that my wreath was too sparse, so I flipped the stamp and made another loop with the candies facing the opposite way. I stamped the little bat from the same set on a scrap of 110lb cardstock. I coloured all the images in with Copic markers. I used Spectrum Noir Sparkling clear overly to give the bat some shimmer, then fussy cut him out and popped him up on foam tape. I covered my candy corns with Glossy Accents by Ranger, so they would have that shiny look. Once that was dry I popped the wreath up on foam tape and adhered it to my panel, and added the bat. I stamped the greeting from Lawn Fawn's "Booyah" stamp set, using Lawn Fawn Black Licorice ink. Finally, I added a black mat to the panel to coordinate with my bat and then adhered the whole thing to a standard A2 sized card base. Thank you all so much for your votes! Trina I love that your wreath is candy corn, so perfect for Halloween. It is fun to see the way you were inspired by my card. 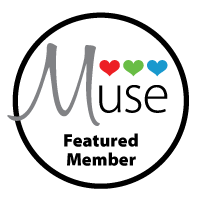 Thank you for sharing with us at Muse! Ha! Oh this made me laugh! I love how you captured the graphic modern feel, but changed the holiday! Thanks so much for joining us at Muse this week! This is fabulous and I was thinking you are combining the two holidays by changing the wreath! I'm not ready for Christmas either! This is a great interpretation ! !